For someone to have a rising sign in Libra, it must appear on the horizon at the very moment of their birth. Perhaps one of the most curious facts about ascending signs is that a person can have one rule for them and also for solar signs. However, other people may have a different ascendency from their solar ruler. When they are the same, the analysis of their characteristics is simpler and all the influence exerted by this sign is more intense and striking. In cases where they differ, the solar sign has a greater representation of their inner personality, and the ascendant speaks about how you receive the experiences that life offers. The rising sign in Libra appreciates each type of calm and harmonious relationship; this applies to both their professional and personal life. They are very sincere companions and always have a word or a friendly advice to offer. They are also very selfless, forgetting even their own needs and desires. When someone needs help, they will assist as if they cannot say “no” to such a person in need. A rising sign in Libra is an ascendant that is tinged with the color of the other signs. Thus, put it in relation with signs of Fire (Aries, Leo, Sagittarius) and it will give energy, vivacity but while being in a state of restraint or balance. Associate it with a sign of Earth (Taurus, Virgo, Capricorn) and it will make you more reflective, more observant, more intellectual, and more patient. Although there is a slight difference when it comes to the sign of Taurus where creativity, rhythm, taste, and colors will be put forward. 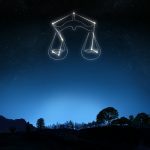 If the ascending Libra is connected with another Air sign (Gemini, Libra, Aquarius), it will make the native of these signs very communicative, very friendly, easy to access and more attentive. With a sign of Water (Cancer, Scorpio, Pisces), you will be very emotional and your sensitivity will make you very empathetic, very receptive, gentle and you will be protective of others. What does your Libra ascendancy bring on a daily basis? Often, you aspire to balance and harmony. Thus, you naturally escape situations of stress or tension. For some, this ascendant sometimes gives you a few moods or a certain craze for doubts. You know how to balance things and you are very diplomatic in your relations with others. For some, you attach great importance to the friendship, the cohesion of things, the family but also the couple, the associations. When it comes to heart matters, your ascendancy encourages you to advocate life together and construction. Your life path is one of balance. So, the whole meaning of your existence will be to find what suits you. Let’s take the symbolism of the Libra sign: the bearings of this one must always be at the same level. If one leans, it indicates an imbalance. So you, more than all other natives, need stability and harmony in many areas.